Read about Valentino connecting with Latio Cosmos, a young South Sudanese man with a bright future! When you support VAD you support girls' education! Our inaugural class of 160 girls in grades 5, 6, 7, and 8 have finished their first month of school and are doing great! Thank you for making the dream of getting an education a reality for these girls. We will keep you posted on their progress in the coming months. To help us provide the girls with school uniforms, donate HERE today. Alucik jewelry is donating 15% of proceeds to VAD. Enter NOMADISTA into the promo code to receive a 15% discount on your purchases. VAD’s Advisory Council member Mascha Davis brought her passion for jewelry and her commitment to helping VAD together by co-designing beautiful pieces of jewelry with Alucik Jewelry. Mascha worked in South Sudan for 5 years and the pieces were inspired by South Sudan’s cultural arts. Yel was born in 1988 near Marial Bai in the village of Manyiel. Everyone in Yel’s family was illiterate. During the war, he first stayed with his father to help protect the family’s cattle. But with constant school interruption, his father sent him to the Kakuma Refugee Camp in Kenya when he was fifteen. After peace came to South Sudan in 2005, Yel returned home to Manyiel and finished primary school. Yel was so excited by the opening of Marial Bai Secondary School. He applied and gratefully joined the inaugural freshman class. He remembers struggling with math during freshman year, but then falling in love with physics. He fondly remembers doing experiments in the science lab - complete with microscopes, Bunsen burners, and chemicals. In 2012, he was a member of the first graduating class. He remembers celebrating with all the students’ families, singing traditional songs and dancing traditional dances. After graduation, he moved to Juba and underwent the complicated process of applying to university. He was accepted into the University of Rajasthan in India to study civil engineering. It was a tough academic curriculum but he got through it. He recently graduated and is going back to Juba where he hopes to get a job building South Sudan’s roads, bridges, and other critical infrastructure throughout the country needs. Storytelling is an important part of South Sudanese culture. It is a source of education, knowledge and history. That is why we have chosen to honor this practice by hosting an annual storytelling event in Los Angeles. This year's event featured six of L.A's best storytellers who shared personal stories of growth, gratitude and courage in an effort to raise funds for our second campus, The Alok Girls Academy in Aweil. We were humbled by the support and generosity of this beautiful community and we look forward to continuing this tradition next year! Valentino spent nearly all of April speaking at colleges and conferences and attending events hosted by our incredible Board and Advisory Council members. Valentino spoke at the Conference on World Affairs at CU Boulder, Portland State University and at Mercy Corp. with World Oregon in Portland, Oregon. At each event, Valentino created a heartfelt connection with the audience and was asked to come back next year. We are so grateful for these events and the new friends we made. Ten years ago, Valentino Achak Deng and Dave Eggers founded the Marial Bai Secondary School to provide an exceptional education to the girls and boys of rural South Sudan. Since then, the school has become ranked one of the best schools in the country. Our students consistently score in the top percentile on the national exams. 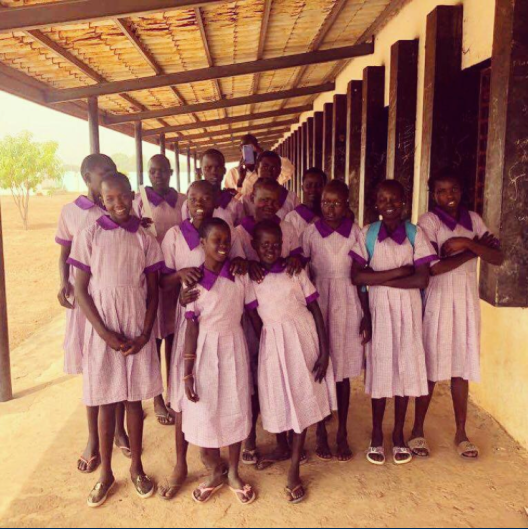 Marial Bai Secondary School is so successful that the South Sudanese government recently granted us a new, additional campus that we plan to open as the Alok Girls’ Academy, an all-girls boarding school. With your support, we are continuing to make a difference by offering peace through education in South Sudan. Mary was expected to quit school and get married after primary school. But when she saw her brother flourish at Marial Bai Secondary School, she decided that she wanted to go to high school before getting married. Mary did just that and joined the freshman class in 2011. She fondly remembers playing basketball, reading in the library, and nightly study sessions under the school’s solar powered light bulbs. She remembers the diversity of the student body—it was the first time in her life that she was able to live with and befriend South Sudanese of different tribes. South Sudan continues to face significant challenges. Since achieving independence from Sudan in 2011, the world’s newest country has suffered years of intermittent civil war and famine. But even in these dire times, young people go to extraordinary lengths to be educated. They, and we, see education as the only path out of the relentless cycle of civil war. The Valentino Achak Deng Foundation is independent of the government of South Sudan, so even when the government cannot fund the country’s public schools, the Marial Bai Secondary School — consistently ranked among the best in South Sudan — can continue to operate. Your support makes this independence possible. And your support makes possible a new generation of well-educated young people with valuable diplomas. Because South Sudan is a new country with a very low literacy rate, any high school graduate is sought-after for employment. Our graduates find work in international NGOs, healthcare nonprofits, the government of South Sudan, and as teachers themselves. Traditionally in South Sudan, many elementary school teachers are themselves recent graduates of secondary school. Because the Marial Bai Secondary School is recognized as the one of the country’s best independent secondary schools, the government of South Sudan recently granted the VAD Foundation an entire campus, already built and ready to be populated with students. It had been constructed by another NGO, which could not operate it. Instead of allowing it to lay dormant, the VAD Foundation will, in 2018, transform it into the Alok Girls’ Academy, a boarding school for up to 144 young South Sudanese women. There is no greater challenge, and no greater responsibility, than to make sure young women in South Sudan are able to pursue their educations without the pressure of domestic responsibilities and early marriage. With your help, we will make sure more and more young women achieve higher education and can then transform society in South Sudan. This is all possible thanks to your support. In June 2018, we aim to open our second campus, a boarding school for girls called the Alok Girls’ Academy. Currently in South Sudan, less than 1% of young women finish high school. We chose the boarding school model to provide a safe and supportive environment where the girls can focus on their studies. The campus will be free from the distractions and demands of their lives at home, allowing the students to complete their studies and be deterred from early marriage. With your help, in June of 2018, we will open the school to 144 girls. Our comprehensive curriculum creates real-world experiences for our students. Chemistry class leads to business development and economic independence as our students learn how to make and then sell chalk, soap, and honey products. We are exploring ways to expand our vocational training opportunities for our students and our graduates. Our students get the best possible education available in South Sudan. However, very few have the means to pay for college. We are now developing an endowment and a college placement program to better ensure that our high achieving students have a place in higher education. Our students study by solar power and learn sustainable farming techniques to improve food security at the school and within their communities. The government of South Sudan granted us a campus that we are transforming into a boarding school for 144 girls. Your support will help outfit the kitchen, build the teachers’ residences, and provide the students with bunk beds, mattresses, and school supplies. Help us repair the roof of our main campus. Help us minimize challenges around transportation costs by providing a vehicle that will support both our campuses. This vehicle will ensure that each school has the supplies it needs in addition to transporting staff and students when necessary..
$5,000 can pay one teacher’s salary for an entire year. $500 can send a girl to school for an entire year. $75 can provide one set of science laboratory equipment. $50 can provide one student’s textbook and school supplies for a year. Donate — every penny counts! Volunteer — as a small non-profit with a small staff, we have ongoing needs that could benefit from your assistance. Connect us with universities that can provide scholarships for our most promising students. Host a house party, dinner at your favorite restaurant, or read What Is the What and include a fundraiser as part of your book club.